You are here: Home / Gheorghe M. Constantinescu, DVM, PhD, Dr.h.c. Dr. G. M. Constantinescu is investigating the gross anatomy of domestic and laboratory animals in general, focusing on the locomotor apparatus, the peripheral and autonomic nervous system, as well as on the anatomical nomenclature. The latter work was used to write and illustrate two sections of the “Illustrated Nomina Anatomica Veterinaria.” He is one of the five members of the Editorial Committee for the 5th edition of the Nomina Anatomica Veterinaria, and the only one representing the two Americas. 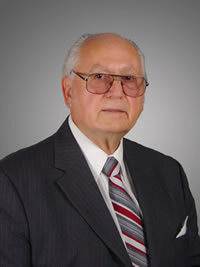 Dr. G. Constantinescu is also a medical illustrator; he wrote and illustrated his own books “Clinical Dissection Guide for Large Animals” and “Guide to Regional Ruminant Anatomy Based on the Dissection of the Goat” and “Clinical Anatomy for Small Animal Practitioners”, the last one translated into Portuguese, Japanese and French. As co-author he contributed with text, and illustrated several other books in English and in Romanian, some published, others in press.